Hey everyone :) Hope you are having a good Friday! Today starts the next round of voting for the Stampers Quest Search for the Trail Master. The theme this week was masculine cards. This is the card I submitted for the week. 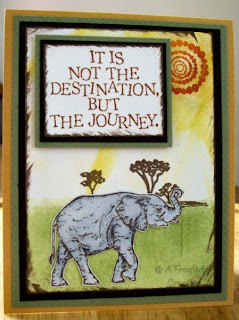 Stamps are from FireCracker Designs by Pamela set called Elephants on Parade. The sentiment was received in a swap and wasn't marked so I don't know who made it. Inks are all Memento and Palette, using sponges to apply color. The elephant was colored with Copics and cut out to adhere to the card front. I went the multiple layers and no embellies route on this one since it was designed for a man :) Although I know he appreciates the cards I know he isn't as fascinated with the bits and pieces like some others are. what a pretty card. the elephant looks tired but that sentiment is just awesome!